Summary: Kurokami Medaka, a first year, is elected as Student Council President, and the first thing she does is establish a suggestion box. Since she was just elected as Student Council President, she's holding all the Student Council's responsibilities, and wearing their armbands. So she asks her childhood friend, Hitoyoshi Zenkichi, for help. After filtering through the suggestions, which were mostly ridiculous complaints or congratulations on becoming president, they find out the Judo Club needs one more member to participate. So, Medaka volunteers her and Zenkichi, who have both been practicing Judo for years, to help train the club and borrow Zenkichi for the match. I just downloaded the one-shot. I liked it so far. It will become one of my favourite series! I can feel it! The art is so clean and nice. Don't you agree? And is it me, or is it one of the few martial arts genre in shounen jump? (Don't get me wrong if I am not correct. I'm not that experienced with shounen jump to begin with! ^_^;; . Do you think it will stand long? Haven't really seen much of the first chapter, but from what finestela says, it's leaning more towards Sket Dance than did the oneshot. But i'm sure it'll branch out afterwards. I love the art and the story in the one-shot really grabbed me. I think this will be a favorite of mine if it continues along the same path. The art's really nice. If it does lean towards Sket Dance then I'll be thrilled as it's one of my favourite series. A truly wonderful manga. The art is very unique, but I personally don't like the main character's design. He looks, uh, faggish? I bet a hell lot of group will scanlate this due to popularity and all. Anyway, hopefully this series won't be much like Sket Dance for long and stand out soon. For the meantime, this series will be on my favorites list. Wow, this is one great manga!!! I wonder if the author's gonna continue the storyline in the serial or come up with a completely different storyline with the same characters? I just read the one-shot! Good, good I have to say. Let me ask you something. What do you mean that it will probably lean towards Sket Dance? I mean how is Sket Dance? From what I have heard, it is mostly comedy and slice-of-life. Am I right? ^^;;; If yes, I hope that it won't lean towards that way. It would be better, if it had some action over just comedy. uh...well I suppose you mean read it online on mangahelpers, you have to upload the download file itself when you release the manga, then it becomes readable online here. I absolutely loved the first chapter. I can't wait for more of this series. Oh! Such a high quality! Thank you very-very-very much! Now let's wait for the spoilers of the second chapter. It will be difficult do make a main plot, it will be probably a series of one-shots until the author comes up with an idea. Personally I liked the one-shot better than chapter 1. Maybe because Medaka was more haruhi-ish there? A main plot will eventually comes up, maybe similar to Reborn, where the main characters and the backgrounds explained in earlier volumes. I do hope this series will last longer. 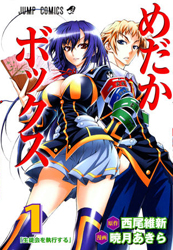 I thought Medaka box was kind of boring. Then again, it's not my type of series. I could see it replacing To-love ru though. Similar protagonist. The new chapter (raw) hasn't come out yet. Seems that we have to wait patiently till it's release. I wonder if the first "arcs" (rather chapters) have to do with finding the other members of the council, because right now there are only two members, but the positions are more. The art is great. But with that being said, I didn't find the first chapter to be anything that impressive. Interesting concept, though it does seem to be an amalgan or Haruhi and Sket Dance...it'll be interesting to see where this goes. I love the running gag of Medaka striking the same pose as the person in the foreground, with an arrow showing her position :-) It always catches me off-guard and makes me laugh out! The art is really great, I also hope that it will last.